The records span more than one thousand linear feet of shelf space. (For comparison, the Los Angeles City Hall building is 454 feet high.) They are stored at a warehouse near downtown, and, unusually for our department, processing is taking place there rather than on campus. Project archivist Kelly Besser, a former LAUSD teacher and Center for Primary Research and Training alum, has been arranging, describing and rehousing the records since January 2012. Project assistant Alyssa Loera joined her in May 2012. 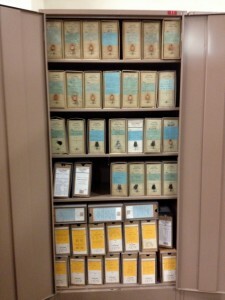 Most of the records were stored in file cases in storage lockers. Other formats included large ledger volumes of Board meeting minutes. 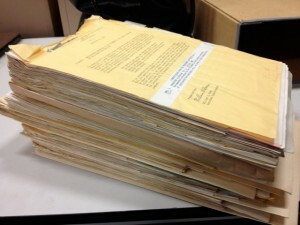 A large portion of the file cases hold what the Board called "Subject Files," and include supporting documents regarding their actions, such as publications, letters, catalogs, lists, and photographs. Readers might not be surprised to learn that one of the first subject files that caught our attention was marked "Library." 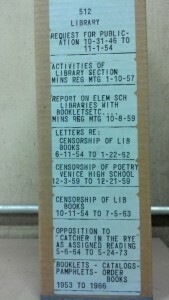 Out of the box, the contents looked like this and included catalogs of books, reports on elementary school libraries, and letters regarding censorship of books. 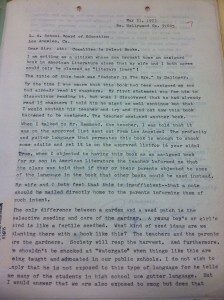 Shown below is a 1973 letter from a student's parent objecting to Catcher in the Rye by J. D. Salinger being assigned reading in an American Literature class. The parent finds the "profanity and gutter language... enough to shock some adults." He goes on to say that "We shouldn't be shocked at 'Watergate' when things like this are being taught and advocated in our public schools." Items such as this give us a sense of the matters of concern for students, parents, teachers and the Board.